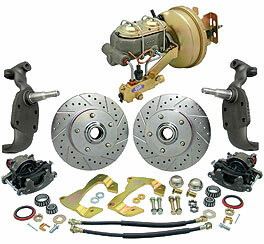 Lower your vehicle 2" and improve the braking performance with our complete drop spindle disc brake kit. Wheels are moved out an 1/8" on each side. Kit works with most 14" wheels and includes 2" drop spindles, rotors, loaded calipers, caliper mounting brackets, bearings, seals, dust caps, spindle nuts, hoses, 7", 8" or 9" booster, master cylinder and proportioning valve. Note: Drop spindles lower the center of gravity while maintaining the full suspension travel. This will drastically improve the ride, braking, steering and handling. Shown with optional drilled and slotted rotors not included in the price.